I have ground beef tacos for us that can come together in about 15 minutes. Seriously, cue all the exclamation points! 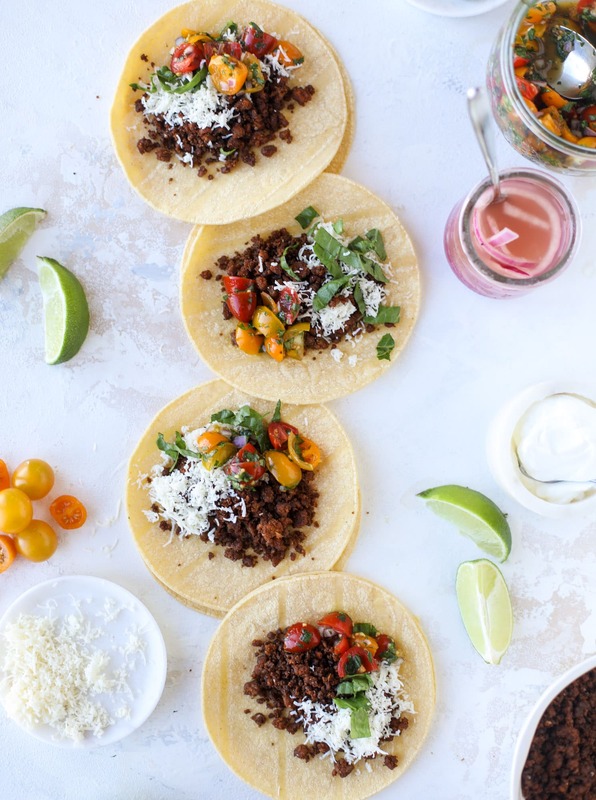 Our favorite seasoned ground beef for tacos is here! This is what I prep on super busy weeknights – and I even prep it ahead of time too. In 15 minutes this seasoned beef will be done and you’ll want to eat a taco or nacho every single night. In case you don’t want to already. I grew up eating ground beef tacos almost every single week. If you were a kid of the 90s, did these kind of tacos make their way on to your weekly menu? My mom used the grocery store spice packets to season the beef and served them with both soft tortillas and hard shells, tons of lettuce, tomato and sour cream. Just like you’d think in the 90s. I loved them then. But now? Those seasoning packets taste like straight cumin + salt. They are actually the reason I don’t love cumin. I don’t enjoy side dishes or meals that are heavily flavored with cumin. Because all I can taste is those old school tacos! Not into it at all. It may just be my weird taste buds, but the overwhelming cumin flavor and scent is permanently etched in my senses. My control freak ways probably play a part in wanting to use my own seasoning blend. So there’s that. I’ve been seasoning my own ground beef for tacos and enchiladas for years. Week in and week out, I don’t measure a thing because I’ve been making them for so long that I can eyeball the spices and judge by tasting. I have a ground beef seasoning in these enchiladas and it’s how I do it for tacos too! It’s the most basic recipe ever – another embarrassingly easy one! But here’s the thing. In my family, there are two very distinct camps when it comes to ground beef. Some people like it to be saucy. You know? I think that with the old school seasoning packet, you’d fill it up with water or something and dump it in – and the seasoning would have a thickener already added. As a result, you’d end up with super saucy taco meat. That’s how we grew up eating it! I’ve seen some recipes add tomato sauce or even a can of salsa. These days, however, I prefer a slightly “drier” ground beef. I hate to even use the word dry because that is not exactly what I mean. It’s just not… saucy. It’s a seasoned, crumbled beef. It almost reminds me of a chorizo! When I make these in our house, each dish can be a little different. The beef and the seasonings stay the same, but sometimes I add a diced sweet onion and bell pepper. That stretches the beef a bit and also makes it a bit juicier. I also use this exact same recipe with ground turkey. And often, I mixed ground beef and ground turkey to double it! 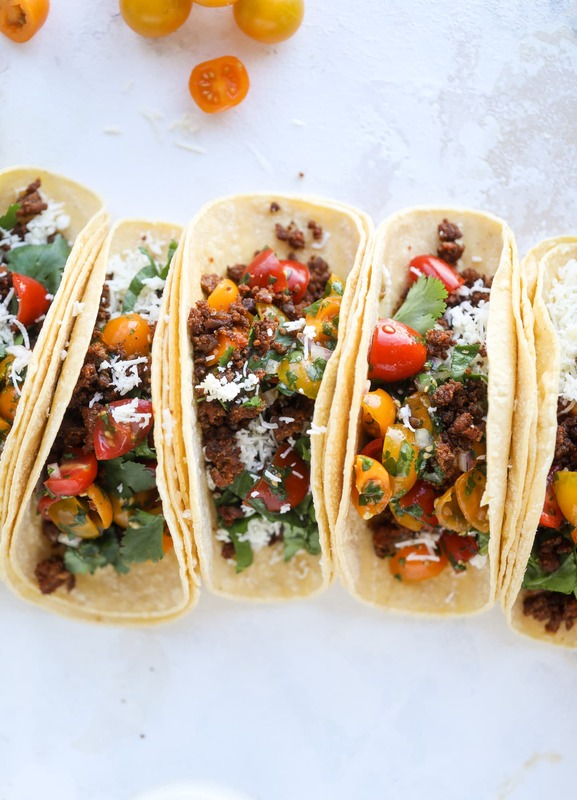 While it may not be authentic at all, it’s the way we love to eat ground beef tacos best! This seasoned beef freezes well. It lasts a few days in the fridge. I absolutely LOVE it over taco salads. If I make this for dinner, I often use it up for lunch leftovers, throwing it on top of lettuce, some avocado, any extra pico and a few crumbled tortilla chips. Those are key. And another reason that this non-saucy beef is so delicious? You can use lettuce leaves for it too. If it’s not overly saucy, that means it isn’t as heavy and will sit nicely in an iceberg or butter lettuce leave, leaving room for toppings. It’s incredible! Finally, it’s also the beef that I use for nachos, any sort of quesadilla and to stuff those mini sweet peppers. Adore it. With these weeknight chicken tacos being one of our most used recipes (and one of your favorites too! ), I’ve wanted to share our beef version for a long time. 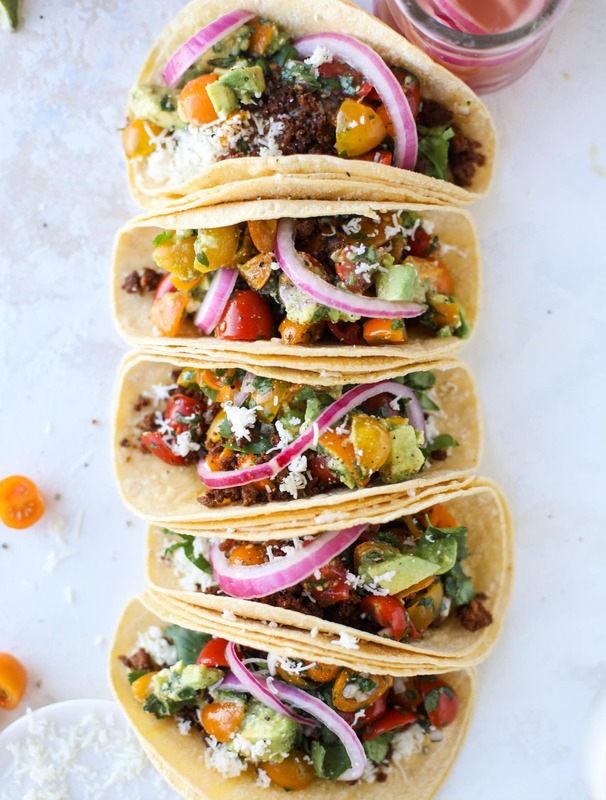 Of course, if we ever have shredded pork or beef on hand, we love to make tacos with that too. Same with seafood, usually going with shrimp or cod. 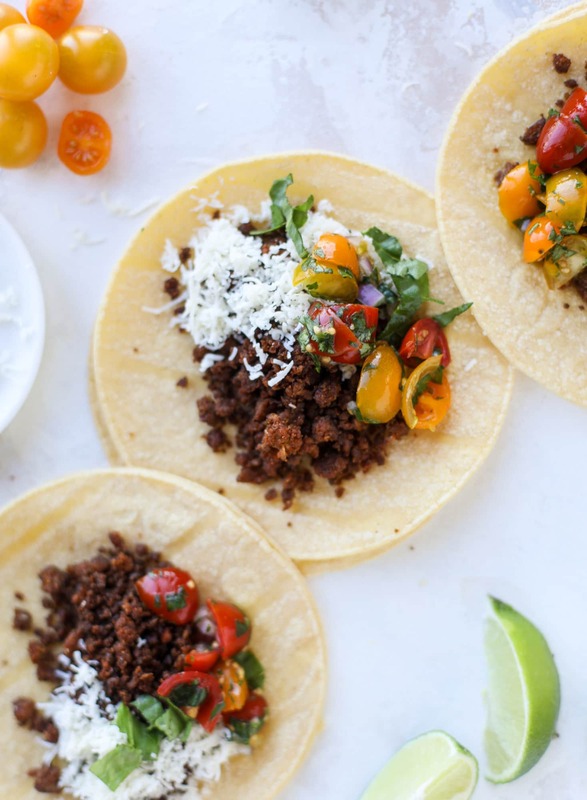 The recipe for ground beef tacos below is as basic as it gets. It’s the simplest recipe for seasoned ground beef – just the beef and seasonings! You can sauté minced garlic, diced onion and bell pepper in the skillet before adding the beef if you wish. Make it your own. These days, I’m more of a quick pico-and-cilantro person when it comes to toppings, and of course I’ll never pass up a little grated cheese. If I have pickled onions in the fridge, I love to throw those on top too! And the truth is that I will NEVER tire of tacos. Never ever. 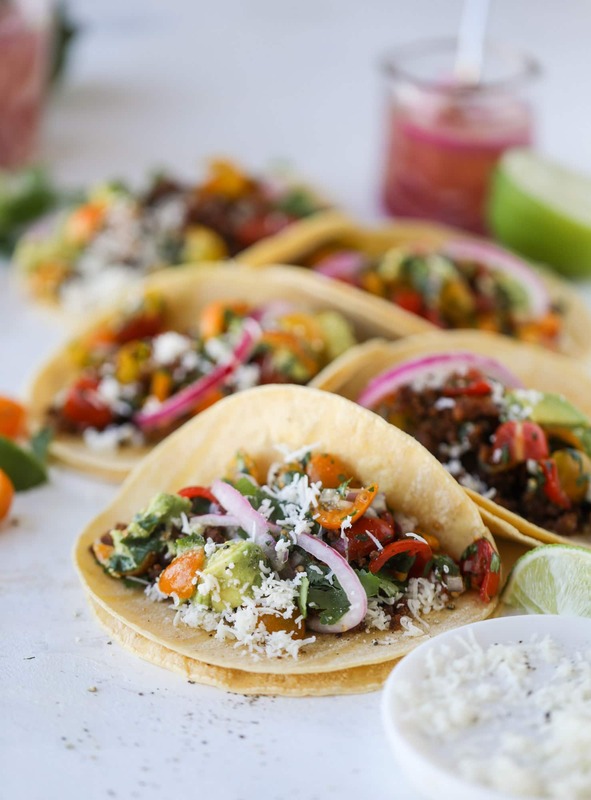 Weeknight ground beef tacos that are anything like the 90s! 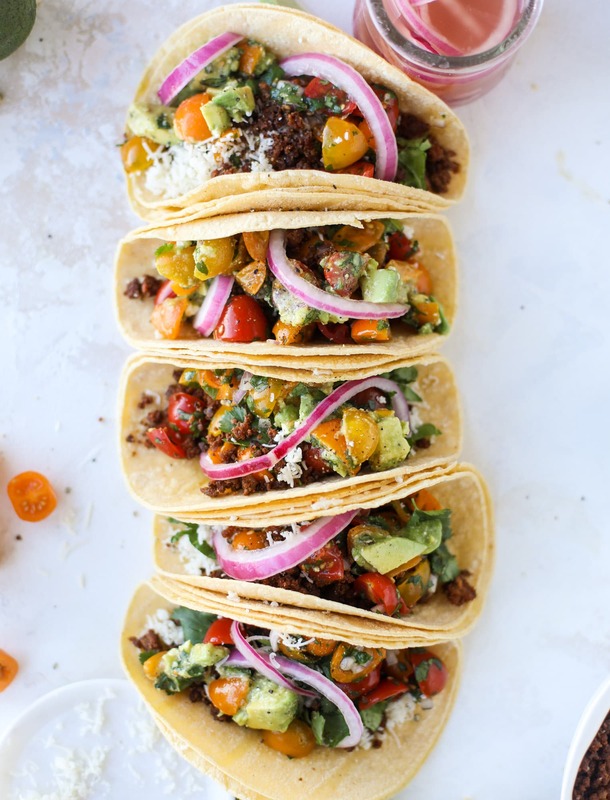 These are made with a homemade taco seasoning and served with the perfect toppings! Heat a skillet over medium heat. With ground beef, I rarely add any oil to the skillet because it tends to be fattier. If needed, you can add 1 teaspoon of olive oil (of your oil of preference). Once the skillet it hot, add the ground beef and break it apart with a wooden spoon. Cook, stirring and breaking apart the beef often, until it begins to brown. Add in the cumin, paprika, garlic powder, chili powder, salt and pepper. Stir well to disperse all the seasonings. Cook until the beef is just browned. I love the seasoned beef like this – it’s a personal preference. If you’d like it saucier, follow the directions below. You can also add in a tablespoon of beef or vegetable stock, or even tomato sauce, to make it saucier. 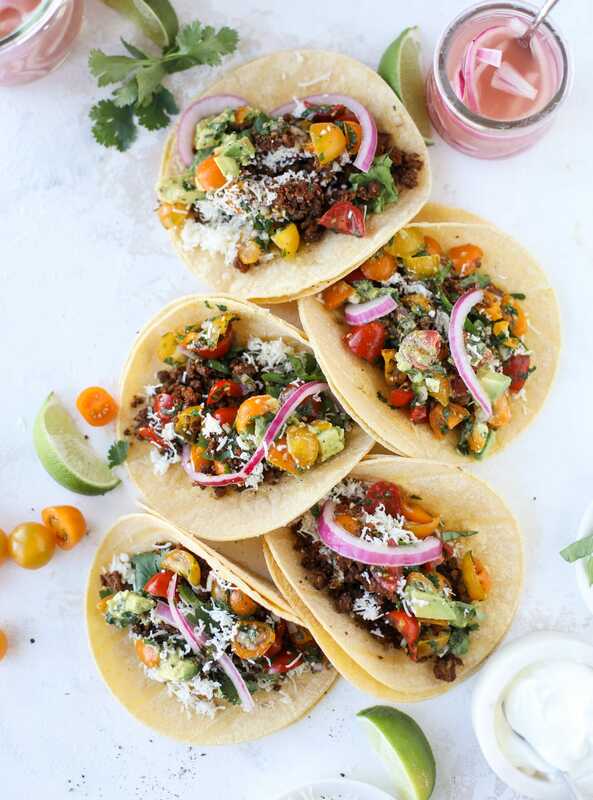 Serve the ground beef in tacos (warm corn or flour tortillas in the oven for a few minutes), on nachos or in salads. We like to top ours with a quick pico de gallo, fresh cilantro, white cheddar cheese, diced avocado and pickled onions. If you’d like to add peppers and onions: heat the skillet over medium heat and add 1 to 2 teaspoons of olive oil. Add in 1 diced onion, 1 diced bell pepper and a few minced garlic cloves with a pinch of salt. Toss well and cook until softened, about 5 minutes. Proceed with browning the beef above! I use a slurry to make my homemade ground beef saucy. Fill a shaker cup with ½ cup cold water or beef/vegetable stock. Add 1 ½ tablespoons all-purpose flour, masa or whole wheat flour to the liquid and cover it. Shake for at least 30 seconds. With the skillet on low heat, slowly stream in the slurry while stirring with a wooden spoon. Stir often and cook over low for about 10 minutes. Taco exhaustion just doesn’t exist. Bring on the beef taco dinner goodness. I love this seasoning mix. I agree that the packets can be almost be underwhelming to what a tasty taco should be. I will make the seasoning mix a head up to have on hand for tacos or enchiladas, one less thing. And your right I don’t know if I could be friends with someone who doesn’t love some form of tacos, Thanks Jess! I’m 37 and we ALWAYS had beef tacos growing up. It was one of my moms staples. Haha! Nostalgia! yes! i hear you! my mom still makes them! We had these growing up, too! And both my husband and I dislike cumin now. Ha! P.S. Have you tried Condado in Lawrenceville? Pure bliss!!! hahaha i love that!!! it’s so true. those packets ruined cumin for life. OH HOW I HATE CUMIN! I blame Old El Paso tacos and one more thing… About 20 years ago there was a slew of business with names like Dinner Done. You would go and prep freezer meals for the week or month or whatever. Ring a bell? Well, they always were heavy on the cumin. Now when I cook I only add a dash. ha, i did always hear about those but never went to one! yes, the old el paso ruins EVERYTHING. Loved the pictures in this post! Especially loved the creativity of the last two pictures! Yes! Child of the 90s and we had ground beef tacos all the time. My mom would put all the toppings in the Tupperware veggie tray thing. She’s even freshly grade the cheese and I would proceed to eat it straight from the bowl. I still make them all the time. It’s jusy three of us so I can get two meals out of it so it’s perfect. YES! i remember eating the cheese from the bowl too. ha! Hungry and exhausted after a long, busy day at work and I’m sitting here drooling while reading this post. I wish I had a huge plate of these tacos right now! Thanks For this Article is Very helpful. Do you have any recommendations for breaking up the ground beef into smaller ground beef? I realize it is already ground but I struggle with getting it to break down more………..using just my wooden spoon can leave me feeling like I could use something stronger or bigger or???? Just to break it down more evenly…. So any suggestions would be welcome!!!! i always use my potato masher! works great! I struggle with using a wooden spoon to break up meat, too – I find a flat-edged spatula (metal or plastic) works better for me because it has a thinner edge. I did just learn from an America’s Test Kitchen recipe that a potato masher works great to shred meat (who knew?! ), so maybe I will try it with ground meat, too. interesting!! i will have to try that! Loved this seasoning. Used it on leftover shredded pork from a Christmas pork roast. Added a can of black beans and doubled the seasoning. Super good! 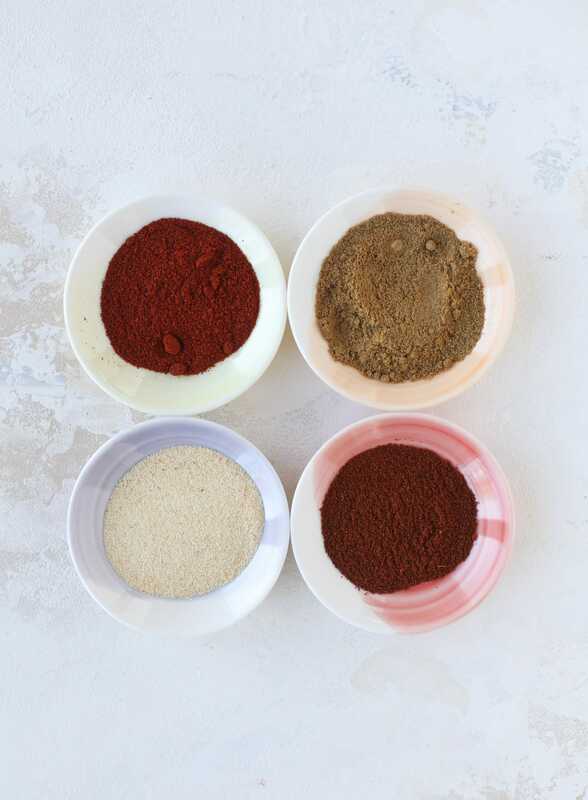 I’ve been making my own taco seasoning for awhile now but this was way better! I’m 37, and this meal was a STAPLE. I had no idea this was such a universal 90’s experience.